Hatch Chile Margarita’s for any occasion! Yes, I know there has been an empty seat at The Table for a couple of weeks – between two trips, a new job and getting my oldest off to school it seems I haven’t had a spare moment to think let alone cook – and it has made me just a little crazy!!!! So the other night I actually had a little time to cook…. and with a refrigerator full of Hatch Chiles from Melissa’s Produce I was itching to get into the kitchen!!! But first.. I needed a DRINK! So, I decided to find out. And I liked it… a lot. In thinking about this drink, two different approaches came to mind. One entailed steeping the Hatch chiles in my “spirit of choice” and the other was to muddle the Hatch chile with the drink ingredients. Since it was going on 5PM I opted for the latter (not having the time to wait for the first because as I said, “I needed a drink!”). So I muddled. And created what can best be termed a “version” of a margarita on the rocks. (Yes, I know I am stretching the term here a bit but all the creative “juices” went into the creation of this drink and not the nomenclature…). The flavor of the Hatch chiles was subtle and I definitely think the flavor would be more pronounced if the chiles were steeped in say, tequila or vodka. Started a batch steeping so when it’s ready I will let you know! Speaking of Hatch chiles did you know we are right in the middle of the season??? In case you missed it, it ISHatch chile season right now!!! Related to the Anaheim chile, Hatch chiles are only grown in Hatch, New Mexico. The warm days, cooler nights and volcanic soil of Hatch, New Mexico infuse these chiles with a floral, herbacious note giving them a lovely, rounded flavor with just the right amount of heat without the bitterness that many other chiles have. They are a bit meatier than other chiles which makes them easier to roast and skin and once roasted you can freeze Hatch chiles to enjoy all year – which is good since their season is very short!!! Wondering what else you can make with Hatch Chiles? 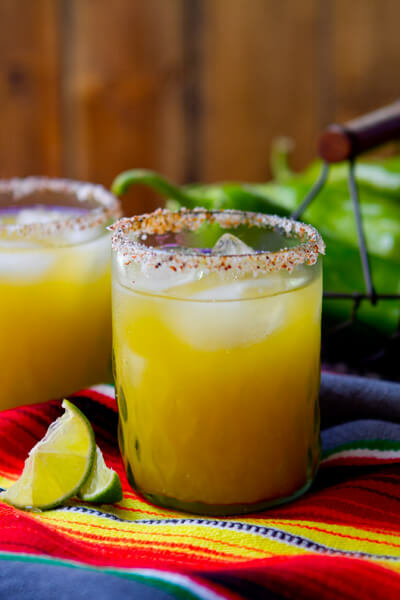 This entry was posted in Recipes and tagged beverages, drinks, hatch chile margarita, margarita. Bookmark the permalink. What Are The Best Cheeses For Your (Hatch Chile) Burger?